Some days are heavy, weighed down by the gravity of loss. Some days are light, a happy haze of sunshine, adventures and excellent company. Some days you find out that your favorite birthdate twin is suddenly gone, departed far too soon. Some days your partner in life and everything is far away. 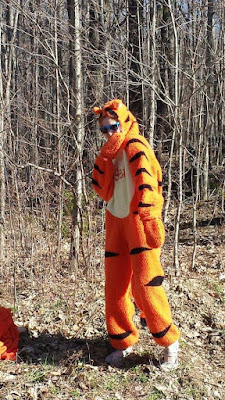 Some days you get to be Tigger, bouncing, tree climbing, cheering and laughing in the woods. Some days are filled with running and friends and parties and campfires. One day you realize that all your days are miraculous. It is due to a series of miracles that you are alive and healthy, that you are surrounded by amazing humans you are lucky enough to call friends, that you live in a world filled with so much technology that everything is literally at your fingertips. So much so that time travelers from the past would think you are some kind of sorcerer. That's how magical and miraculous your everyday life has become. On the heavy days, remember the lightness and the miracles. The best of which are these people, the heart and soul of all your days. Lyric of the moment: "My whole life looks like a picture of a sunny day..." ~Sleater Kinney "Modern Girl"